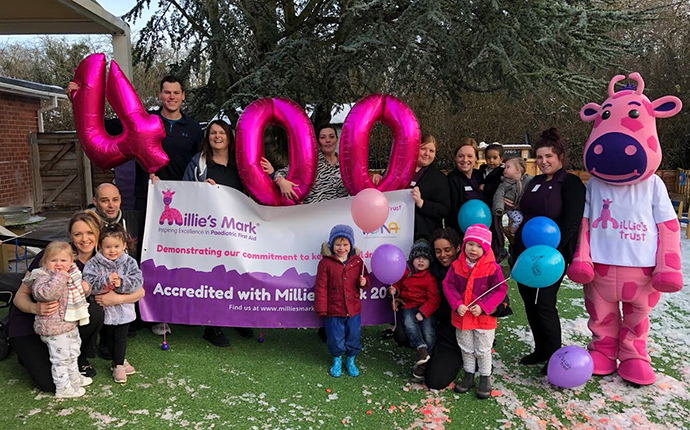 The number of early years providers with Millie's Mark accreditation has now reached 400! The 400th setting to be awarded is Woodlands Day Nursery, in Altrincham - part of the Elmscot Group of Day Nurseries. They held a celebration event attended by Geoffrey Giraffe from Millie's Trust! Purnima Tanuku OBE, Chief Executive of NDNA, said: “We are thrilled to have our 400th accredited nursery named as the ‘Outstanding’ Woodlands Day Nursery in Timperley, part of the Elmscot Group. Nursery staff have worked extremely hard to meet the highest standard of paediatric first aid and reassure parents that their children are in safe hands. “It is fantastic to see the difference Millie’s Mark is making across the country. There have been several serious incidents where practitioners have been able to react. The children received the help they needed and are okay. This gold standard in paediatric first aid has even been praised by the emergency services. Well done to all recently awarded settings! Interested in signing up? Read about the accreditation process here.